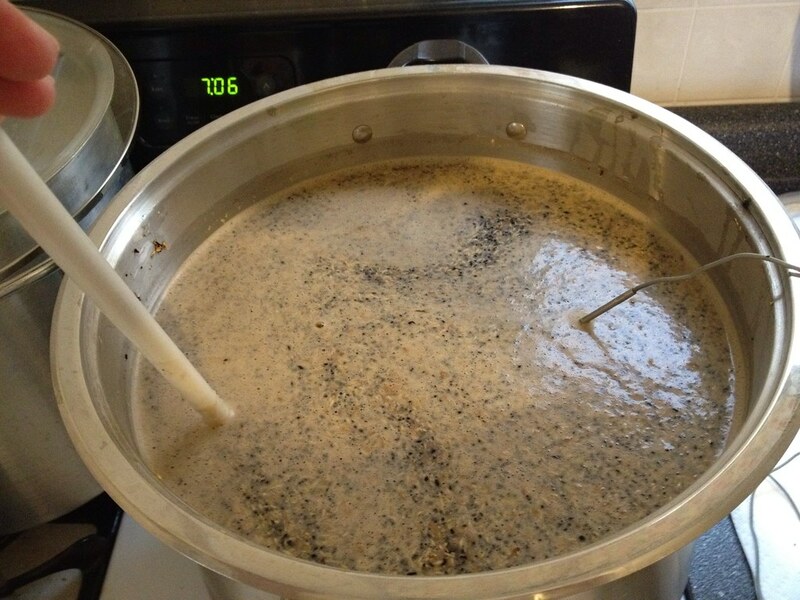 If you dig back deep enough into the archives on my blog, you’ll see that I’ve done some brewing in the past, but I haven’t done an actual beer. For some reason I got all motivated to do an all grain brew, so I stopped by Great Fermentations in Indy to get some stuff. I wanted to make something I would like to drink, but I also wanted to find something that could be developed into a platform for experimentation. I’m a fan of big porters, and I’d also been kicking around the idea of doing a persimmon porter, so it was kind of a no-brainer. The guy at Great Fermentations pointed me to one of the kits they had for a recipe called “Porter, Call me a Taxi”. It looked good, so I had him get me the stuff for an all grain version of the kit. It was about 10lbs of 2 row malt, and then another two pounds that was a combination of chocolate, caramel and black malt. Unfortunately, I wasn’t as prepared as I’d thought for this brew. 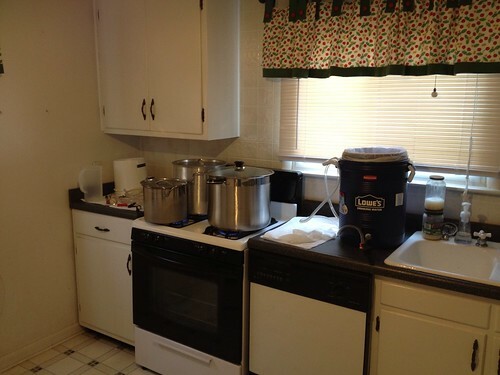 My plan was to batch sparge, and I picked up a couple of water coolers with the intention of using one as a lauter tun. I expected to make my own false bottom for the tun, but it didn’t turn out to be as simple as I’d hoped. After getting nervous about my grain sitting around for a few weeks, I decided to grab a mesh bag from Northern Brewer and try my luck using it as a filtering medium. I’d also gotten ansy about the size of my brew kettle. I’d been using a 4 gallon kettle that came from harbor freight, but I got the idea in my head that I should really get the whole boil (7.5 gallons) in one vessel. I ordered this one from amazon under the logic that 30Qt = 7.5G = enough. Unfortunately, this is bad logic. Yes, 30Qt is 7.5 gallons… right up to the top. This means that there is no room to have a boil, let alone a vigorous boil. To add to frustrations, this kettle doesn’t actually hold 30Qt. It’s more like 24Qt. I don’t know what the deal with this is, but I decided to just work around it. It’s a nice kettle otherwise, and worth the modest price. I’ve read a reasonable amount about the all grain brewing process, and could probably go through the motions, but I wanted to actually figure out what I was doing. I started by reading some first person tutorials including this one where I saw some of the mashing process. The point of the mash process is to generate fermentable sugars. The author of the site started off with a two part rest. (this means bringing the grain and water to a certain heat and leaving it there for a certain amount of time) The first part is the sachrification rest whose goal is to get the starches out of the grain. Next is the protein rest, whose goal is to convert the starches into sugar. Apparently for the homebrewer, any more than just the protein rest isn’t necessary, but I figured that since this is the source of the fuel for fermentation, I ought to spend a little time with it. 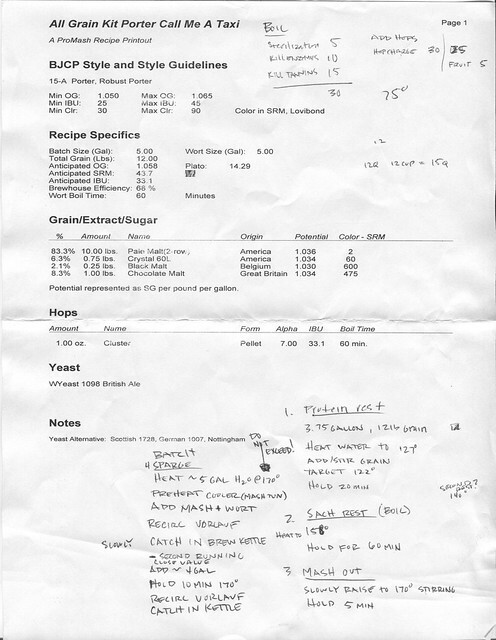 Next I checked out the all grain section on www.howtobrew.com and found another rest schedule. This one used 3 rests at 104 – 140 – 158°F, as specified in the hombrewing book by George Fix. In this case, the low temperature rest is to help liquefy the malt to help release the starches. Some slight detail is also given on how modifications to the rest times can affect dextrosity, alcohol content and malty-ness in the end product. These temperatures are what I went with for 30 minutes each rest. I also looked into water quality.. I was lucky enough to find a recent water report for my city from a user on the homebrewersassociation.com message board. As the OP stated, it’s not a lot to go on, but I guess it’s nice to have a record. The chloramine freaked me out a little, and I didn’t have any campden tables to add. I just boiled all the water in advance, and hopefully it neutralized most of the crap. My final bit of research was In regards to hop schedule. Let it be known that I really don’t like the flavor or aroma of hops. My recipe only called for 1oz of hops, but I decided to half it anyway. I read a bit about the hop infusion process on this page , which I think also drew from the George Fix book, and ended up adding them for the last 30 minutes of my 60 minute boil. You can see my complete procedure notes below for intimate details, but all things considered the brew went ok, and mostly to plan.. One deviation from plan was that I did a second small batch with the later runnings that I wanted to use as an experiment with persimmons. The biggest problem I had over all was temperature regulation. It took a long time to get my initial boils going, then it took a long time to cool down to my target temperature. I didn’t have a whole lot of ice on hand, so I tried putting an ice pack in a ziplock bag and submerging it. It had practically no effect, and the zip lock ended up leaking. I had the same issues in post striking processes. Even with the wort chiller, I was only able to get the wort down to 90 degrees. I suspect the high ambient temperature in the kitchen (~80) had something to do with this. This gave me some interesting design ideas, but I think in the immediate, I’m going to have to bolster my chilling system. Another problem I had was consistently stuck sparges. I suspect the mesh bag was getting bunched up in the cooler’s drain hole. 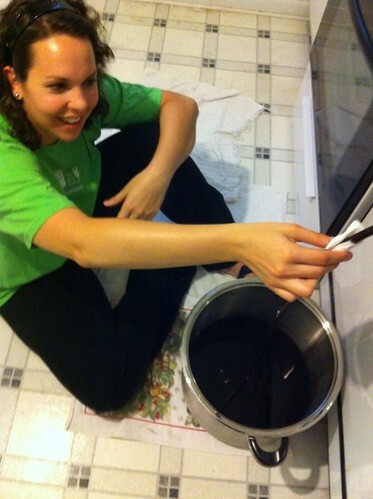 Using my long spoon, I was usually able to move the bag away from the drain and get most of the wort through. I’m sure this effected my efficiency quite a bit. I wasn’t getting the full batch out of each sparge, so I think I ended up doing around 4 batches. The last one was for my secondary small batch. 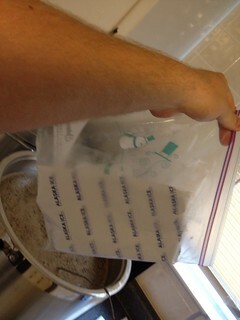 I just picked up the bag, and squeezed, getting most of the wort out. I think I got about 2 or 3 gallons. From this point out, everything went pretty much according to plan. For my small batch, I added 1 cup of strained persimmons that my Grandmother gave me last year, in the last 5 minutes of the boil. As I understand it, adding a fruit adjunct during the boil will provide more aroma than taste. 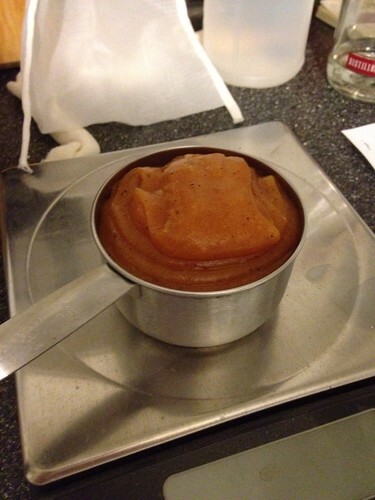 Thus, I plan to add another 2 cups of persimmon during secondary fermentation which should work more to the flavor. I used a different yeast for the small batch than what was called for in the recipe. I had some saferment ale yeast in the fridge, so I went with that. Having never done an actual beer, I wasn’t sure what to expect in regards to primary fermentation activity. 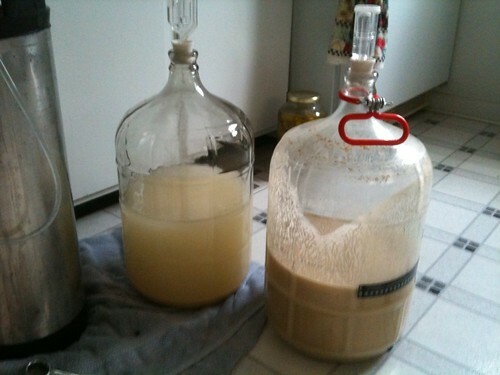 What I witnessed was fairly tame, peaking at the first and second days of fermentation. Now, two weeks later, there is no visible activity. This seems like a pretty short time, but I suppose only a gravity measurement will tell. FWIW, my post boil gravity showed an ~80% brew house efficiency. I don’t know if I believe that calculation. Also notable, the coarse mesh bag didn’t do as good a job filtering as I’d hoped. There was quite a bit of traub, and even after careful racking, there’s a lot of sediment in the bottom of the fermenters. I’m going to have to add some kind of filtering step, but I’m not sure how short of buying a pump and force filtering, which is kind of out of the budget. I’ll probably rack the main batch to a keg this weekend for a long secondary fermentation, and add the remaining persimmon to the small batch and let it go for a while before kegging. Watch for a result update in the future. So I started the experimental banana brew last night that I’ve been mulling over for some time now. I based it off of a vague, traditional Ugandan recipe, but made some significant changes. Most notably, rather than using only banana juice in the wort, I used puree’d bananas. 2 reasons for this.. First, juice extraction seems time and yeild restrictive. While I’ve read that there are scientific methods to yeild up to 75% juice, I’m certain I can’t come near that. Secondly, the journal articles I’ve found regarding banana starch seem to indicate that it’s kind of “self worting”, ie: the ß-amylase breaks down the starches into water soluble sugar chains. This also means that it has high diastatic power, and can break down other starches, in my case, millet flour. The most questionable aspect of this experiment is the amount of bananas I used. I was shooting for around 1/3 the total volume of the brew, (a 5 gallon carboy) which came out to be 5 bunches. This 1/3 figure was derived from the original recipe, but the 1/3 was the amount of banana _juice_. I expected the whole bananas to be less potent, but to also have a higher fermentable sugar output. since I have neither a metric or means for measuring these yet, it just called it even for the sake of experimentation. After adding the banana slurry, I added sterilized water with millet flour mixed in. (note1: don’t add flour to boiling water note2: the only place in town I could find millet flour was natures pharm) I then added a dry ale yeast starter that I had pitched about an hour earlier. The reason I went with this yeast was because I had it on hand, no other reason. Traditionally, the natural banana bacterias would be the sole fermentation agents, and may be something that I try later on, but for now I wanted to try and keep it as clean as possible. This included a dilemma as to whether I should heat the wort to try and kill the bacteria. (as I did with the last batch of cider) After talking to Belinda and Nancy about it briefly, it seemed like the heat might interfere with the natural starch->sugar process, and if my pitched yeast was strong enough, it would probably overwhelm the natural stuff anyhow. There was little activity last night, but when I got up this morning I found a decent amount of off-gassing, as well as an airlock full of banana sludge. The brew had settled out and about half the carboy was traub. This is my main reason for doubting the amount of bananas added, but I’m hoping that the solids will continue to break down as the yeast works. To this end, I’m planning on agitating it daily, and I’m guessing I’ll be changing the airlock daily as well. My only concern other than the solids is the mystery esters that may be produced.. but then again, if I knew what was going to happen, it wouldn’t be much of an experiment.